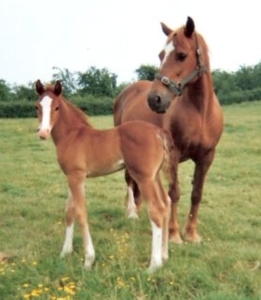 Ousbek was purebred Arab, bred in France, and was a quality sire of sport horses and ponies; he had an amazing temperament, excellent confirmation, natural paces and huge jumping ability. 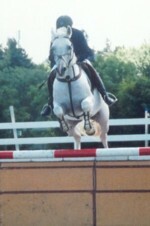 Ousbek competed at top-level show jumping in France and England. In France, Ousbek competed internationally on junior teams, including winning a silver medal in a nations cup. In 1998, Ousbek was imported to Britain, where for approximately a year he was ridden by Ricki Hill, in his last year of Junior Jumping, in this year Ousbek won £1,245, as well as representing Great Britain in CSI competitions. In May 2000, he was awarded with BSJA Silver Stallion Disks. 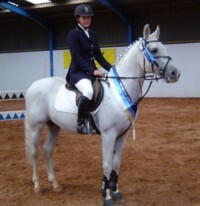 In 2001, he was bought to stand at the Renkum Stud in Sussex, where after several disappearing acts over a 5 foot hedge to visit the neighbouring mares, he was sold to the Colne Valley Stud, where he stayed until his death in 2007, enjoying the occasional show jumping competitions, with his senior rider Marie Keen. 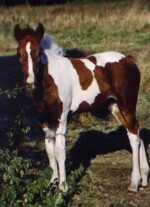 In France, Arab blood can been found in a lot of competition horses and ponies, unlike in England where Arabs are mainly used for showing. 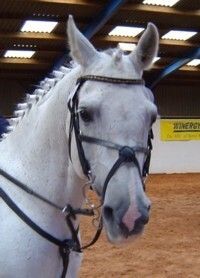 Ousbek is by ‘Arzew’, who has sired numerous, show jumpers, eventers, and dressage horses/ponies. Other offspring include Tichka du Lys, Jedai de Beesede, Dael de Uhlan, Ines du Barry, Hedjaz Khan, First de St Hubert, and Dazilha de Montgay to name a few. 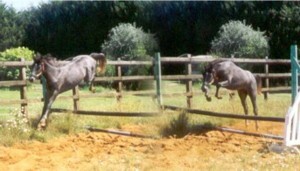 Ousbek started his show jumping career in France as a 4 year old. For the first 2 years he competed in horse competitions winning 102 French SJ points in 1994 and 114 in 1995. In 1996 he started competing in pony competitions and in the next 3 years (1996 to 1998) he earned a total of 320 points; he also represented his country in internationally, including winning a silver medal on a junior nations cup team. In addition, Ousbek found time to earn another 185 points in horse competitions! Ousbek attracted a wide range of mares from a 12-hand pony to a 17.1hh Advanced Event mare, many JA pony mares, including Millstreet Rose and End of Decade, as well as 2 full sisters to the international SJ Garrow Owen, and a full sister to the SJ pony Sannan Valley Top Tier. Ousbek’s offspring are all showing his excellent temperament, movement and agility. 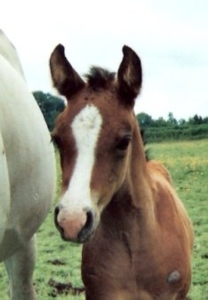 His first crop of foals have all been loose jumped, and all are showing scope and agility. As well as ‘Elite’ status with the SPSS Ousbek is also approved with the Anglo European Studbook, and in France he is approved with Cheval de Selle (Selle Francais), Poney Francais de Selle (Selle Francais Pony), Arab Studbooks and the Pony and Bardot Societies.